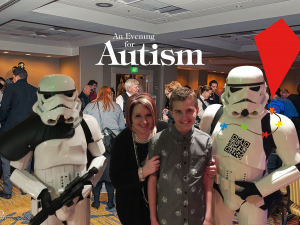 Our annual “An Evening For Autism” event is Saturday, February 9th, 2019 at The Washington Square Embassy Suites. This year’s event theme is a Romantic Sci-Fi Themed Casino Night! We have a variety of Monte Carlo games: including Blackjack, Roulette, Craps, Let It Ride, and Card Poker! There will also be wine, beer and ale raffles, silent auction, and a live auction. We also have Star Wars Video games, spinning tops, coloring books and more! We will, once again, have auctions items including Star Wars posters signed by actors like Mark Hamill, Carrie Fisher, Harrison Ford, Peter Mayhew, Kenny Baker, David Prowse , Alec Guinness, George Lucas and John Williams! While you’re here, hang out with Storm Troopers, Wookies, Pilots and more from Star Wars Oregon. We also have superheroes like, Superman, ant-man and others from Portland Superheroes coalition. Finally, we have more characters, like Belle, Strawberry shortcake and Spiderman from Cosplay Characters for Kindness! YES! The 12th annual Sean’s Run for ARROAutism is definitely happening. In 2017 we applied for a permit to use the Historic Columbia River Highway for the run. Wouldn’t you just know it, though, that later that same week the Eagle Creek fire decimated, and closed, the area. As always, however, we persisted and have finally received our approval to open a section of the trail just for event. And you know what that means, right? Yep, it’s time for you to go to http://signmeup.seansrun.org and get yourself registered! We have walked the trail already and it is beautiful. There’s definitely evidence of the fire, but the forest is already returning to vibrancy. That also means that, as a participant, you will have a rare opportunity to run this scenic trail and see it in all its beauty with just a handful of people. But the ONLY way for you to do that is to register now. And what better way to get such a rare opportunity than by knowing that your dollars are helping the ARROAutism Family Holiday Assistance project as it brings relief to Autism families during the holiday seasons. Every year, ARROAutism helps more and more families in counties throughout Oregon. With your help, we are continuing to expand that invaluable assistance, and are even working on expanding assistance into SW Washington. So please, join us now, invite your friends, families, neighbors and co-workers for a special day of scenery and support. We’ve even moved the start time to 9AM (Registration to open at 8AM) to ensure that you have enough time to safely make the drive out to Cascade Locks. It’s about an hour’s drive from some parts of the Portland Metro area, so plan accordingly. Last, but not least, we’d like to send a big shout out to our corporate sponsors for helping to sponsor this year’s event. If your company would like to sponsor Sean’s Run, or any other event, please don’t hesitate to reach out. We are a community, and we can only succeed with your support. 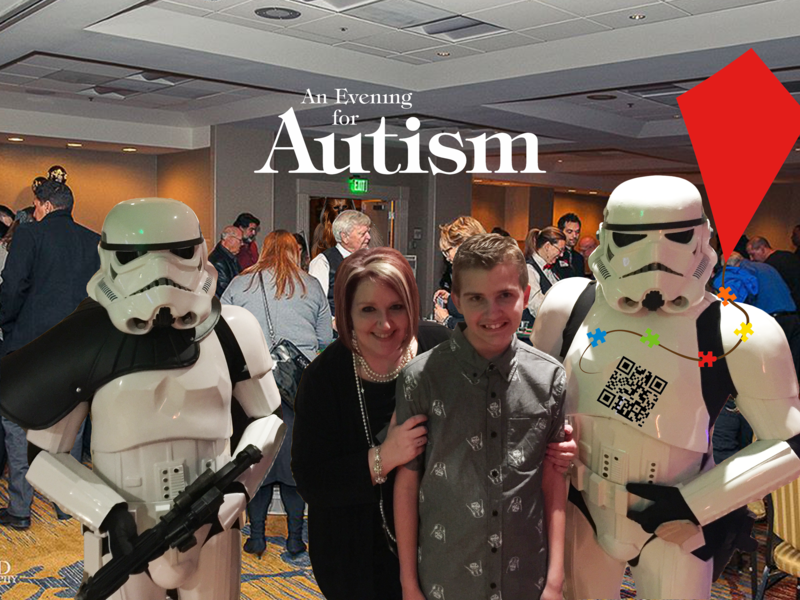 Our annual “An Evening For Autism” event is Saturday, February 10th, 2018 at The Washington Square Embassy Suites. This year’s event theme is a Romantic Sci-Fi Themed Casino Night! Doors open at 6 p.m. and the event ends at 10 p.m.
We will, once again, have auctions items like trips to the Oregon Shakespeare Festival (including accommodations), A Timberline Escape, Rose Festival Tickets and more! This is the main event to fund the Family Holiday Assistance Project, which provides gift cards to families with Autism in need through the County Case Management Programs during the Winter Holidays. Every 4 tickets purchased helps 3 families this holiday season. Okay. Yes. We’re less than a month out, and I know we’ve been very quiet. Rest assured, we are still planning on holding Sean’s Run. Why so quiet, then? Honestly, there is so much behind the scenes work that has to be done, and we’ve run into some wrinkles with new federal government limitations that are resulting in changes to the course. So. Yes, we are definitely planning on having Sean’s Run this year. The start/finish line, however, will be changing, which will also impact where you will be parking. 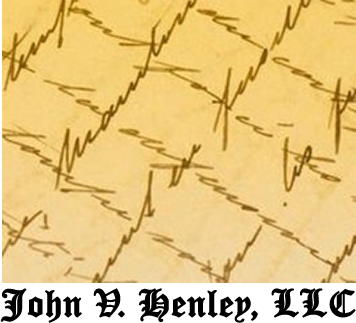 Since we are being forced to change such critical items with no advance notice, please stay tuned to this page and to our website, where we will be posting more details as soon as they are finalized – hopefully during the first week of August, 2017. We are pleased to finally announce that we WILL be holding Sean’s Run for ARROAutism, as planned, on August 19th. The start and finish lines will be at 9825 NE Sunderland Ave, Portland, OR 97211. This year’s run will once again give you a rare opportunity to run along some of the scenic Columbia River Dikes; areas normally closed off by gates, but, by special permission of the Multnomah County Drainage District, those gates will be open for us! This does mean that the course this year should be considered as much a trail run as it is a road run, since portions of the course may be uneven, even covered in grass, even as other portions of the trail are groomed. Unlike runs from previous years, this year there will be very little asphalt running, so your plan your times and footwear accordingly. Also, since we are holding the event in August, we are also moving the registration time up to 07:00 AM and starting the run at 08:00 AM. This will ensure that all runners are off the course before the hottest part of the day. Last, but certainly not least, the course itself is an out and back 5K, so 10K runners will be running 2 laps. Aid stations will be set up at both the starting line, and the 2.5K marker, which will also serve as the turnaround for all participants. Your participation in Sean’s Run is a great way to learn more about Autism, and the money you help us raise is used for various ARROAutism projects, including the ARROAutism Family Holiday Assistance Project, which helps hundreds of Autism families in need during the holiday season, every year. Other ways of supporting ARROAutism include making direct donations, and purchasing Seans Run Apparel, participating in day of events, and joining in other ARROAutism functions, like the Evening for Autism and Rock for Autism. So, plan to join us at 8AM on Saturday, August 19th, and help us celebrate Sean’s Run and help raise money for ARROAutism projects! Our annual “An Evening For Autism” event is Saturday, February 11th, 2017 at The Washington Square Embassy Suites. This year’s event theme is a Romantic Sci-Fi Themed Casino Night! We will, once again, have auctions like trips to Disneyland, or to New York City to the play Hamilton! We will update this post with more details on those soon! Yep. It’s the first weekend in November again. You know, the week after the climactic end of Halloween fun that begins an hourglass countdown to that body wrenching activity known as Time Change. Even though we go through it every year here in the the United States, you may not have remembered that you need to change your clocks as you go to bed this Saturday (November 5th) (unless you wanted to wait until the official changeover at 2am on the 6th). This being fall it means it is time to apply that mnemonic “Fall Back,” and turn your clocks back by 1 hour such that 7am is still 6 am – ahhh, another hour of sleep – the only thing that makes this arcane activity worth doing. Also, remember, the Fire department also reminds us that this is a good time to check the batteries in our Smoke Detectors. It’s worth checking your Carbon Monoxide (CO) detectors at the same time. This is obviously a significant issue for those with sensory integration issues, so, if you haven’t already, put this on the calendar to do while your sound sensitive family members are at school, work, or another appointment. Daylight Savings Time (also known as DST) has been around since the late 1800s, and is probably just as controversial now (check out this article from the Washington Post) as it was likely to have been then . Not every country uses daylight savings time. In fact, in 2011, Russia re-joined Japan, China, India, and 156 other countries by getting rid of daylight savings time. In the United States, Arizona, Hawaii, Guam and Puerto Rico and the Virgin Islands do not observe Daylight Savings Time. What’s more, the start and end dates of Daylight Savings Time vary from time to time, and from country to country. In the United States, Daylight Savings Time was extended several weeks back in 2007 as part of the Energy Policy Act of 2005. As a result, Daylight Savings Time in the United States (Oregon included) starts (springs forward) on the second (2nd) Sunday in March, and ends (falls back) on the first (1st) Sunday in November. 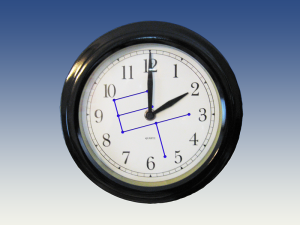 Now, if it seems like Sunday’s time change is barreling towards you faster or slower than a normal Sunday would normally approach, then this video on “Why Your Perception of Time Can Change” is just for you! Many thanks to Billy Blues Bar and Grill for a fantastic fundraiser. We can do such amazing things when we come together as a community. Thank you! The final tally for The Rock For Autism Benefit for ARRO Autism Research and Res ources of Oregon was $10,487.00!!! When people come together we can accomplish great things! We would like to thank all of the sponsors for their contributions, Hard Notched Customs, Entercom Radio and Tim Taylor, Corwin Beverage Company, Widmer Brothers Brewing, Columbia/Young Market, Craig Stein Beverage Vancouver, Tropical Image Tanning, Lunatic Tattoo, Filbin’s Ace Hardware, Vancouver Wa, Cascade Flooring America, LLC, Heathen Brewing Feral Public House, Jorges Tequila Factory, Pioneer Fence, Deck & Patio Covers, Warehouse ’23, Beaches Restaurant and Bar, Mayer’s Custom Meats, Southern Wine & Spirits, Main Event Sports Grill, Maletis Beverage, Kendall’s Pioneer Distributing, Priority Life Chiropractic and Massage, Beard’s Framing Stores, 5 Guys Burger and Fries, Sysco Foods, Pacific Seafood of Oregon, Jakes Meats, Franz Bakery, McDonell & Thomas Accounting, Finish First Innovative Designs & Higher Grounds Coffee. This event was a huge success due to your generosity and we are truly grateful for your donations! A special thanks goes out to all the musicians! Lovedrive, a tribute to the Scorpions, Metts, Ryan, & Collins, Shoot to Thrill – An ACDC Tribute, & The All Stars Brian Harrison, Kevin Hahn, Jeff Buehner, and David Kendall. It was an incredible night of rock n roll! A special thanks to Cheryl Bland, Glenna Brown & Kathleen Henly for all their help with the raffle. Thank you to Mike Branch for all you do and your relentless support of Billy Blues Bar and Grill! A genuine and heartfelt thank you to Maury Brown for asking us to host this event. It was truly an honor and we are can’t thank you enough for all of your support! Last but not least thank you to the droves of people who poured through our doors and stepped up and made a magical night. You have made a significant impact for many families and from the bottom of our hearts WE SALUTE YOU! It’s an age old story. You’ve done it, I’ve done it – and we’ll both do it again. And, lo and behold, I find a whole page of info. It’s almost too much, but I waded my way through it, and documented what I found so that I could share it with you, and make the whole process much easier (and faster)! 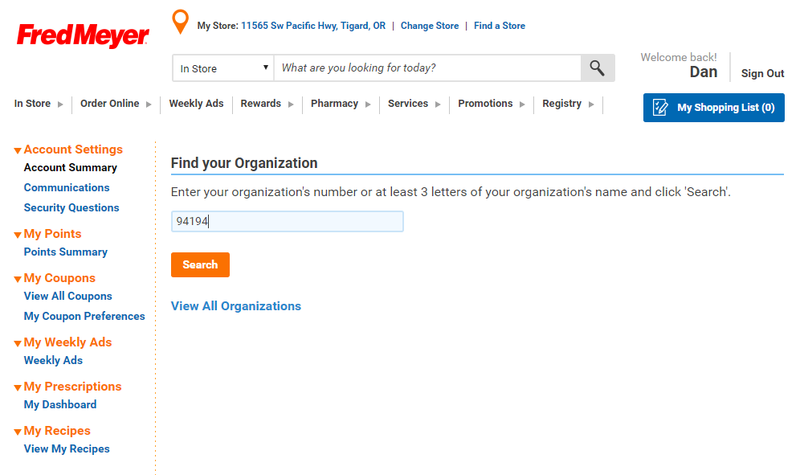 Okay, it’s more like six steps, if you include logging in, and the confirmation page. But, really, it’s four steps – which should take about five minutes. Note, if you’re prompted to change your password, you may be able to just re-use your same password. Click the “Account” button – it’s on the red strip and has the profile of a person on it. To quickly find us, type our id : 94194 and click Search. 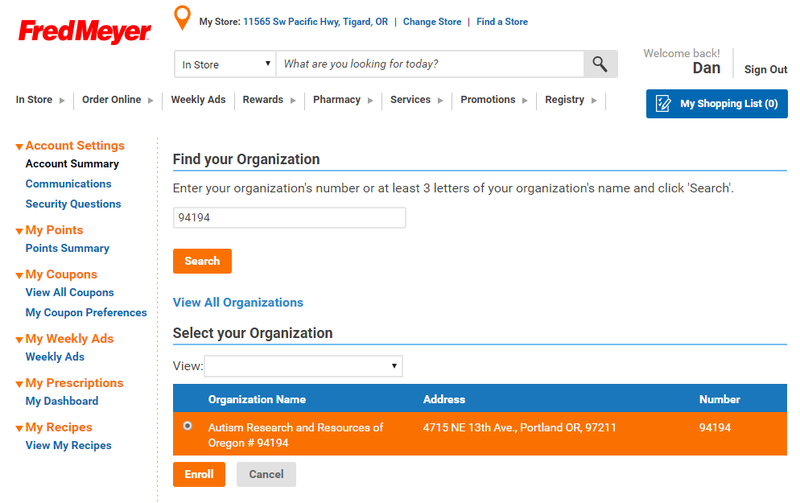 Click the little circular radio button next to Autism Research and Resources of Oregon #94194 , which will highlight us in orange, then click the orange Enroll button. You should now see your account summary screen and the text “Your enrollment in the Community Rewards Program has been updated. Thank you for participating!” And, given the success of this program, we couldn’t agree more. Okay, so, it took me longer than that. Actually, considerably longer. But that’s why I put this together. Hopefully you can take a look at this, know exactly where to go and it will take you about 5 minutes. If you ever want to see just how much money this program generates for us, simply through your normal, every day purchases, just check our donation page at http://arroautism.org/donate . Thanks so much for taking the time, and for your support. We’re here to make a positive difference for Autism Families in Oregon, and we couldn’t do it without you. And, now that I’ve sat down and done my bit, hopefully you’ll take a few minutes to do the same.